For the third year wonderful floral displays are up on lamp posts throughout the village. Working with Blarney Chamber of Commerce, these are a welcome addition to the village for tourists and locals alike. Many thanks to our small, but committed, band of volunteers who turn out every week to water the flowers – no small task! Blarney Tidy Towns are delighted to be a part of the Muskerry News campaign to raise funds for the installation of a publicly-accessible defibrillator. Let’s hope we never have to use it. 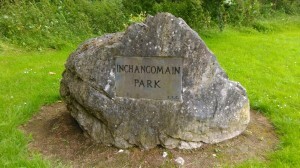 Great to see our Gateway people tackling the Inchancomain Park. Many will remember that a lot of work was done there on our famous RTE television programme some 3 years ago, unfortunately the good work wasn’t kept up. So we are looking forward to the area being greatly improved, thanks to the Council and Gateway people. Why not take a walk down there and show your appreciation? If you would like to organise a clean up of your area please call Kate on 087 2330398 and Blarney Tidy Towns will supply you with pickers, bags and access to a container to leave the rubbish.